Aside from pontificating at the front of a classroom, hands down my favourite thing about teaching is developing schemes of work. I find there’s something extremely satisfying in developing a project that forms part of a larger whole, knowing its place within that whole, and knowing what else is needed in order to guarantee a good coverage of skills. While there may be people out there who think I’m an oddity for feeling like this, I met several kindred spirits at Huddersfield University this June to discuss exactly this and address the problem of dull key stage 3 ICT. Having spent a long time revamping & firming up our schemes of work this year, I thought it might be helpful (for me as much as anyone else) to talk about the process I undertake when developing a scheme. Step one: What do you want to achieve? Simple case of outcomes, here. As briefly as possible, what do you expect students to come away from the project with? Students will learn about the problem of e-waste and use their computer skills to create an awareness campaign to spread the word to their chosen target audience. Step two: What have you got? How long is the key stage? 2 years? 3? How many weeks should be spent on the project? What do they already know? How much time will have to be spent building skills? Are there any SEN/literacy issues that would greatly affect delivery of the unit? How old are they? How able are they? Are there opportunities for paired/group work? What resources do we already have? Are we able to buy any additional material in? Step three: How will we know it’s been successful? This has been complicated/helped depending on your point of view through the introduction of APP, which as I noted in a previous post I think is an excellent tool for covering every base when developing a programme of study for KS3. Because of this, it’s the yardstick I’ve chosen to measure our curriculum by, supplemented by the level descriptors. Like many schools, we’re moving from a curriculum with units based on competencies (spreadsheets, presenting information, databases) to larger, project-based units in which they learn how to do a little of each of these things. When teachers from other subjects ask why their year 10s are incapable of plotting a graph in Excel, I point to the fact that they could have gone 12 months between instances of opening up Excel, let alone using it. ICT is an application subject, and the learning by its very nature should be applied. Having trialled a few projects last year, I’m happy to report the new approach has been far more successful than fencing off competencies – or even programs – as we have in the past. So, when I have my focus for the project, know the amount of time & resources I have to play with, I’m able to pick out the success criteria for the project from the APP assessment grid, aiming to cover at least two Assessment Focuses. As you can see, the project is very AF3-heavy, with elements of AF1, and no AF2. As a result, I’ve planned a couple of AF2-heavy units to balance this out over the entirety of year 7, but another option would be to drop in a short data-handling exercise – possibly working with a small database of contacts to MailMerge some e-safety docs to. It’s a little crowbarred, which is why it didn’t go in, but it’s a possibility. Step four: How are we going to do it? 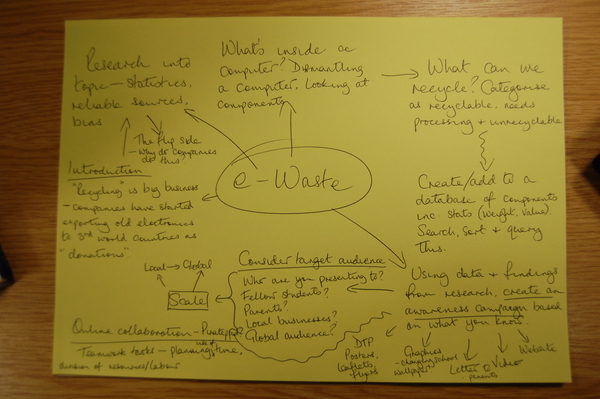 Now comes the point where we tie everything together, from resources to success criteria, in the written scheme. 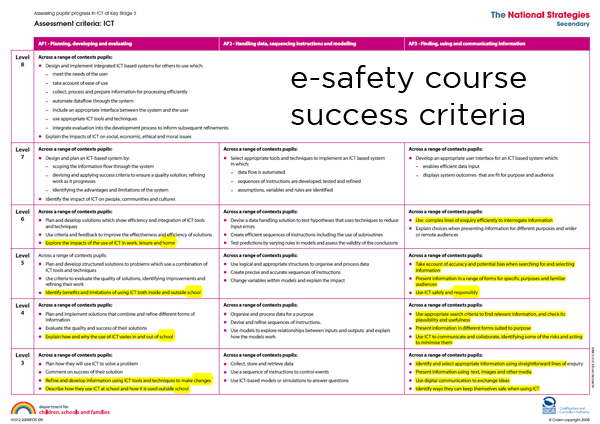 Most of mine have an accompanying Moodle course where the resources are hosted, so when revisiting my e-Safety scheme last half-term I spent some time checking that resources still worked (some didn’t! ), added a selection of new ones and referenced them in the scheme. 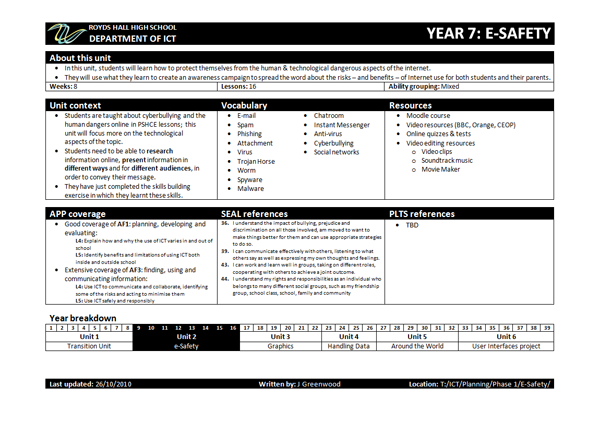 My scheme of work template is something I’m quite pleased with, being as it is detailed, comprehensive but easy to dip in to. Download a blank copy to play with, or take a look at my e-Safety scheme of work by clicking the image below. I’ve added sections in which I can address things like SEAL & PLTS; hideous, woolly notions that are otherwise extraordinarily difficult to quantify & provide evidence for. To do this, I have grids to draw from for each, so it’s a simple matter of selecting the appropriate criteria & dropping them into the scheme. The end result is a comprehensive scheme of work in which I’ve provided my colleagues with a loose timeframe, expectations & suggestions about how to achieve them and all the resources they need… but this isn’t quite the end of the story. Step six: You aren’t done yet! Putting together the framework for a scheme of work is the biggest obstacle, but it’s not finished as soon as you’ve written the last activity. Projects are living, breathing things that need to evolve along with the learning they’re there to underpin. Teachers using it should add resources to the repository, tweak activities that didn’t work, or add activities they ran that did. I developed a scheme of work in my first year of teaching, and once I’d put the finishing touches on it I printed it to PDF in a fit of self-satisfaction. Schoolboy error. A scheme of work with no room to grow has a limited shelf life. Planning like this is time-consuming & labour-intensive. Don’t force yourself to redo it every year because your original plans didn’t have enough longevity in them. Wow, a really comprehensive guide. I also love doing schemes of work, especially if making one which is quite creative or very cross curricular (I am a Primary School teacher after all). I especially like how you have made it completely focused on the success criteria, where I tend to focus on a scheme outcome, looking at what the kids want to produce by the end of the scheme, with the initial lessons providing them with the tools to reach that outcome. A very useful post, thank you!